Recognizing the impact this song has had on the state and its inhabitants, the West Virginia Legislature has adopted a resolution naming “Take Me Home, Country Roads” one of West Virginia’s four official state songs. 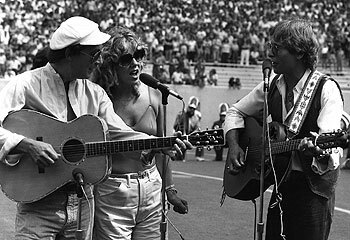 The song was written by Bill Danoff, John Denver and Taffy Nivert in 1970 and was recorded and released in 1971 on John Denver’s album “Poems, Prayers, and Promises.” It reached number two as a single on the U.S. Billboard’s “Hot 100” chart. House Concurrent Resolution 40 states, aside from radio and record success, “Take Me Home Country Roads” has been performed regularly at most important events within our state, including the memorial service for Senator Robert C. Byrd, the dedication ceremony of Mountaineer Field, and the pre-game and post-game ceremonies at athletic events at West Virginia University. “Take Me Home, Country Roads” can be heard outside of the state as well. It has become an international hit, as it is regularly played during Munich’s Oktoberfest. Senate Bill 58 would allow for a voidable marriage or annulment if one spouse is unaware of the other spouse’s felony conviction from before the marriage. Senate Bill 90 would make it a misdemeanor to intentionally interfere with or prevent a person from calling emergency service personnel. Violating this would result in a fine between $250 and $2,000 and/or jail time from one day to one year. Punishments would increase with each offense, with a fine between $500 and $3,000 and/or jail for three months to one year on the second offense, and fines from $500 to $4,000 and/or jail for six months to one year on third offense and beyond. Senate Bill 322 would provide that all state employees, employees of state institutions of higher education and the Higher Education Policy Commission be paid at least twice per month, as opposed to only twice per month. Senate Bill 378 would prohibit someone from driving a motor vehicle meeting or overtaking a stopped waste service vehicle going at a speed over 15 miles per hour. This would apply if the waste service vehicle uses flashing lights or a visual signal and is not located in a private driveway, controlled access highway, turnpike or road with a center line and more than two lanes. Violating this would result in a misdemeanor, with a fine between $300 and $1,000 or jail confinement for a maximum of one year. Senate Bill 387 would clarify that duly authorized officers from the District of Columbia and other states have lawful custody of prisoners they are transporting to or through this state. Senate Bill 394 would change the Health Sciences Scholarship Program to the Health Sciences Service Program to better reflect the program’s purpose of recruiting health care professionals to underserved areas of West Virginia. Senate Bill 405 would protect the private information of petit court jurors by limiting the availability of juror questionnaire forms. The juror’s forms would only be available with the written permission of the judge who presided over the trial after it concludes. Senate Bill 408 would remove the three month good conduct condition as a prerequisite for parole. It would also require the Parole Board to consider an eligible inmate’s parole regardless of whether they are in a facility not administered by the Division of Corrections. Senate Bill 456 would extend the expiration date for the health care provider tax on eligible acute care hospitals from June 30, 2014 to June 30, 2015. This program is used to maximize the federal match for Medicaid. 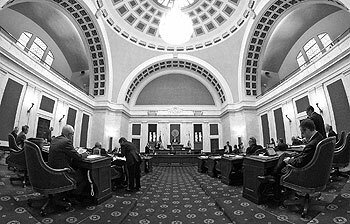 Senate Bill 460 would add West Virginia School of Osteopathic Medicine to the list of state institutions of higher education that are allowed to invest certain moneys with its foundation, limited at $25,000,000. Senate Bill 470 would provide that completed grand jury questionnaire forms are confidential. They would only be released from the clerk with the written permission of the circuit court. Senate Bill 499 would make the Prudent Investor Act the primary standard of care for the Investment Management Board. Senate Bill 558 would find and declare a moral obligation to pay the listed claims against state agencies approved by the Court of Claims with public moneys. It would also provide constitutional immunity of the State from a lawsuit or other legal restriction. Senate Bill 600 would require the owner of a vacant building or property to keep it maintained at a standard deemed reasonable by a governing body. Owners would have to comply or eliminate the public nuisance through repairs, demolition or maintenance. These costs would be paid by the owner. Senate Bill 602 would require employees of health care providers to wear identification badges when delivering direct patient care. This would apply to heath care providers who employee at least three licensed practitioners or more than ten employees. House Bill 2165 would require the clerk of the county commission to issue up to two copies of a veteran’s death certificate. The request would have to be within thirty days of the veteran’s death and no feed would be charged if the certificate is needed to receive state or federal benefits. House Bill 4003 relates to truancy policy enforcement. The bill grants dual jurisdiction to counties in counties where a student who lives in one county but attends school in a different county. The county that the student attends school would have the authority to enforce the truancy laws of that county even if that student doesn’t live in that county. House Bill 4151 relates to military members and their spouses and licensing through professional boards. One provision of the bill provides that military spouses that move here from out of state would receive an expedited temporary license under certain circumstances. House Bill 4287 would update the administration of medication and performance of health maintenance tasks by unlicensed personnel. One of the provisions of the bill is the definition of unlicensed personnel would be updated to a facility member who meets specific requirements and has completed proper and required training, among other stipulations. House Bill 4186 would add provisions to the background check requirements an applicant would have to pass to be issued a concealed weapon license. This would qualify West Virginia for the “Brady Exemption state,” which would allow a firearms dealer to accept a West Virginia concealed weapon license as proof that the holder has passed all state and federal requirements. House Bill 4188 would relocate the Center of Nursing under the West Virginia Higher Education Policy Commission. Additionally, nurses that teach in state nursing programs or practice at a hospital qualify for scholarships. The bill also gives the center the authority of strategic planning to address a nursing shortage, data collection, a website, expansion of the nursing program, among other powers. House Bill 4270 would provide that minimum salary requirements would not apply to service employees that are employed at Cedar Lakes Conference Center on or after July 1, 2014. House Bill 4284 would create the Pregnant Workers’ Fairness Act. This would prohibit the discrimination of pregnant women in the workforce based on pregnancy, child birth and or associated medical conditions. House Bill 4290 would revise provisions of governing checks and money orders sales, money transmission services, transportation of currency and currency exchange. Therefore, the bill updates definitions to federal standards. House Bill 4421 would allow the lottery to award prize winners by check, electronic funds transfer or other acceptable forms of payment of the Federal Reserve System. Currently, the lottery is required to award prizes with checks. House Bill 4425 would give authority to the Superintendent of State Police to hire additional staff at their discretion, specifically legal staff and or council. House Bill 4449 would add proximity detection systems and cameras that are used on continuous mining machines and underground haulage equipment to the West Virginia Innovative Mine Safety Technology Tax Credit Act. This would allow mining companies that install this equipment or already have it to qualify for a tax credit. The State Senate meets as the 2nd Session of the 81st Legislature draws to a close. The 60-day Regular Session ends at midnight on Saturday, March 8th. They will then immediately reconvene for several days to continue work on the State Budget Bill, SB 306.